Dals are split pulses or legumes. It is hard to find a household that doesn’t stock up different types of dals. These dals are soaked and pressure cooked and finally tempered and then perked up with masalas. This section comprises of a variety of the most common dals like moong dal, toovar dal, masoor dal, urad dal to whip up recipes. To add on to their nutrition quotient, combine them with some green vegetables. You can also combine 2 to 3 different dals to make delicacies like Rajasthani Dal. 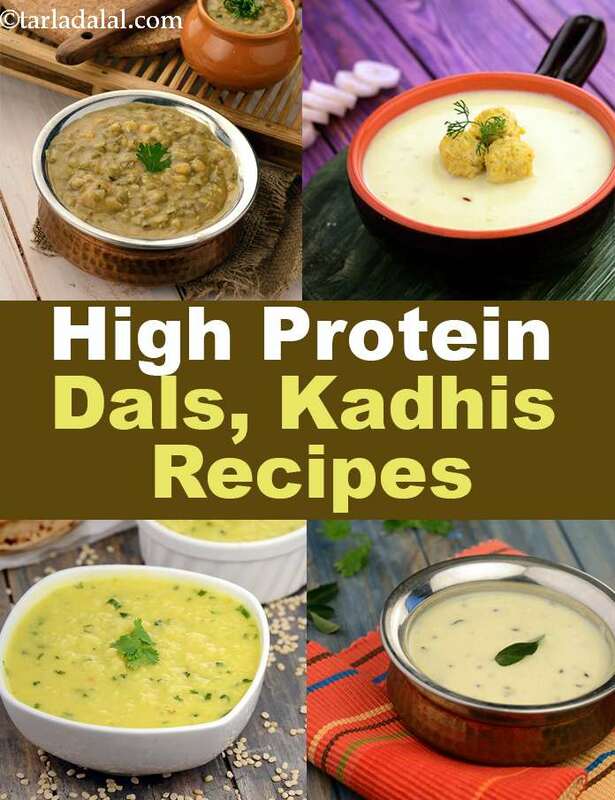 Kadhis which usually contain besan (split Bengal gram flour) and curds are the twin source of protein. If you’re on a low calorie diet then prepare this Zero Oil Masoor Dal, a storehouse of nutrients like protein, folic acid, iron and zinc. Together all these nutrients help to boost immunity along with being weight-loss friendly. Khatta Urad Dal gives a good dose of B-complex vitamins, Calcium, Magnesium, Phosphorus and Zinc. The curds in it add on to the protein value. Co9mbine your dals with vegetables to increase its nutrient content. Methi Toovar Dal is mouth-watering and extremely healthy, brimming with nutrients like iron, zinc and protein. It is good for weight-watchers, diabetics and senior citizens too. Chawli Masoor Dal will become your all-time favourite. Chawli is one of the richest sources of iron and vitamin A and ideal for children and pregnant women. The vitamin A together with the protein in the dal helps to maintain healthy skin and vision, while the iron keeps anemia at bay. We have added a dash of vitamin C rich lemon juice to improve the absorption of iron from the mouth-watering dal. From simple Kadhi to Palak Kadhi and Subzi Kadhi which is a complete meal when served with steaming hot rice as is full of veggies, curds providing all the necessary nutrients. As being low in calories relish this delicacy quite often without any hesitation. Bajra Roti in Kadhi is one unusual preparation which you should surely not miss out on as it helps to keep anaemia at bay. Being rich in calcium and phosphorus this kadhi can help your bones be strong. Enjoy this Radish Koftas in Kadhi recipe with your choice of rice to make it a complete meal. It is also a good way to add vegetables in your diet to provide vitamin A and iron. The curd and besan combination makes the kadhi a rich source of protein and calcium too. A maharashtrian delight, tweaked to boost the health value! while palak adds vitamin a to this dish, chana dal adds nutrients like calcium, iron, folic acid, zinc and fibre. Ensure that you do not overcook chana dal, as it should be separate and not mashed. Spinach and chana dal complement each other perfectly in this aromatic dish which is an excellent source of protein, iron, vitamin A and calcium. Try this dal with steamed brown rice or rotis. This is a good recipe for entertaining too! Dal is healthy, plain or spicy. But, this is one excellent dal you just cannot resist! comprising of four key varieties of pulses, cooked with onions and tomatoes, and perked up with a range of carefully chosen spices, masala dal is just the thing to have with hot rice and rotis.